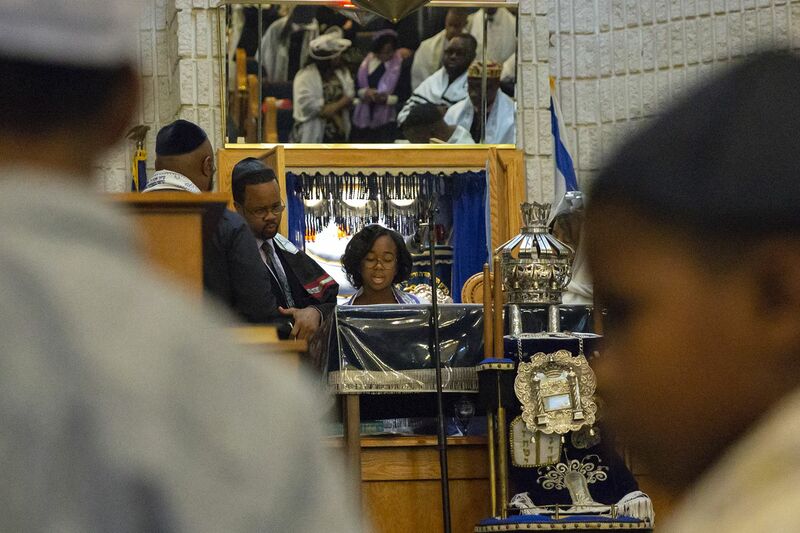 Mikaela Pleasant, clad in a white sequin dress and a purple tallit, poked her head around the large blue Torah she carried as she walked carefully up the aisles of Congregation Temple Beth’El. Rabbis and young children trailed behind her, greeting every member in attendance as if they were old friends reunited. The band struck up a quick and jubilant beat. The cry was met with clapping as the drums slowed and the sound of the final metal cymbal reverberated in the air. Finally, everyone took their seats, and Torah readings began for Mikaela’s bat mitzvah. Bowen said visitors will often confuse their music with gospel, which is associated more with Christianity, but Beth’El’s charismatic music is emblematic of being both black and Jewish: The band includes an electronic keyboard, electric violin, piano, drum set, bongos, bass guitar, and organ. “We stand out,” said Eudora Burton, president of hospitality at Temple Beth’El. She said the upbeat music is their minhag, or tradition. Other unique customs the congregation follows include a dress code for members — white in the summer and navy blue and black in the winter. Bowen will often wear special colors depending on the occasion; for Mikaela’s bat mitzvah, she wore purple to match the 13-year-old. The synagogue also makes an effort to incorporate its youth into the service, either as ushers or by asking them to retrieve the instruments. Bowen said that when blacks in America were free to develop their own culture and expression in a post-slavery United States, many turned to Judaism. Rabbi Debra Bowen, right, sings during Shabbat services as Mikaela Pleasant becomes a bat mitzvah at Temple Beth'El in West Oak Lane. Mikaela’s mother, Hope Pleasant, 43, said the congregation is not affiliated with any branch of Judaism, but identifies as “conservodox,” having attributes of both Orthodox and Conservative Judaism. Bowen warned not to categorize the congregants, though, because they won’t fit into a prescribed box. She said they are Jews, and as long as a person is intent on honoring Hashem, or God, and following Torah, they will be accepted at Beth’El. According to the latest numbers from the Pew Research Center, people who identified as white made up 90 percent of the racial and ethnic composition among Jews in the U.S. in 2014. People who identified as black comprised 2 percent. In the latest study conducted by the Jewish Federation of Greater Philadelphia from 2009, around 6,500 of the 215,000 Jewish people in the Philadelphia region are Jews of color. An updated report will be released in late 2019. A close up of the kippah of Stephen Scott during Shabbat service at Temple Beth'El in West Oak Lane. Mark Leuchter, director of Jewish studies at Temple University, said that oftentimes people within the Jewish community are sequestered, and find it unusual to meet other Jews who are not of European or Middle Eastern descent. Leuchter said there are various intersecting ethnicities within the Jewish religion, despite the common perception of what a Jew is supposed to look like in the U.S.
Linda Polk Carter, 60, of Mount Airy, a friend of the Pleasant family, attended services at Temple Beth’El for the first time that Saturday in November, and said she had never experienced anything like it. Carter, an Episcopalian, had only been to one other Shabbat service, in the ’70s, and, compared with Beth’El, described it as “more quiet." “When you bring in drums and the African roots experience … it was just inspirational,” she said. When it came to Mikaela’s afterparty on the bottom floor of the Hyatt House in King of Prussia, the music changed to Drake and Chris Brown. Rabbis swapped their robes and kippahs for snapbacks and jeans. Mikaela suffered through the the traditional chair lift, but the Pleasant family also performed a hip-hop routine, a unique custom they continued from the first two bat and bar mitzvahs in the family. Mikaela Pleasant is lifted up on a chair during the celebration of her bat mitzvah at the Hyatt House in King of Prussia. Pleasant is a member of the congregation Temple Beth'El in West Oak Lane, Philadelphia. “We embrace our own culture in it,” Hope Pleasant said. Like Beth’El itself: “It’s sort of like lemonade with a twist." Because the synagogue doesn’t collect membership dues, it doesn’t track how many people belong to the congregation. But Pleasant estimates about 100 people attend weekly Shabbat services. Pleasant, 43, was born and raised at the temple. She got married by Dailey, its founder, and Bowen has been her rabbi for almost 20 years.